pinestar studio is located in the western foothills of southern Maine, about one hour west of Portland, and about three hours north of Boston. From our windows we see Pleasant Mountain, the highest point between Mt. Washington and the ocean. We live in an old Cape Cod style house that has an attached barn. Part of this barn is our shop where all the tools are made and where we also repair and restore wood/canvas canoes and small boats. Every year on the third Saturday of April we host the Annual Denmark Sheepfest. Area small flock owners bring their sheep to the Denmark Arts Center for shearing and an all-out wonderful little fiber festival. Mitchell is our gray poodle who loves to go for walks in the woods and is always ready for a ride. We also share our home with Lutie, the cat! He keeps track of everything that goes on here. 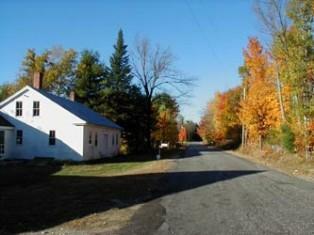 Life in rural Maine is a little slower than in the city but it is where we love to be. We have mountains, lakes, views, and wonderful people. We are not too far away from everything, nor too close. There are all kinds of activities and events so there is no lack of entertainment! Throughout the year we participate in many area festivals and events. We have taken canoes to shows, packed up looms and fibers, trucked sheep and more. We enjoy meeting people and demonstrating what we love to do. So if you find yourself in the neighborhood drop in and introduce yourself, or visit us at the local events when you are here in our neck of the Maine woods. We’re always happy to talk boats and fiber!